On Sunday July 20, for the first time ever, a stretch of downtown streets was closed to cars all morning and open to bikes—as well as Zumba dancing, yoga, roller skating and a rock climbing wall. Open Streets was a first for Pittsburgh but it won’t be the last. A day later Mayor Bill Peduto emailed the organizers—Kim O’Dell, Eve Picker and Scott Bricker, who pushed the idea from the start, along with many other volunteers who worked to make it happen–requesting four more events in 2015. This urban intervention, modeled after Ciclovia in Colombia and sparked by a Pittsburgh visit from Gil Peñalosa, is an example of tactical urbanism, a powerful, grass-roots movement to improve our urban space and our experiences and social connections within them. There are plenty of other examples in Pittsburgh. A hand-drawn crosswalk forming a bridge between underused side streets. Café tables and chairs popping up on Strawberry Way to please the downtown lunch crowd. Local food dinners under the stars in alleys downtown. 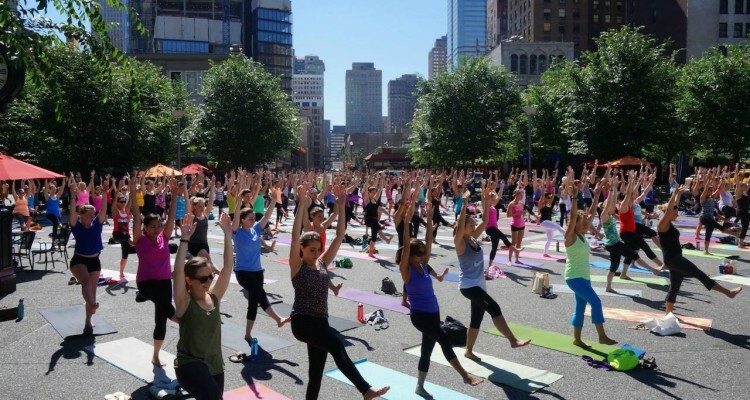 Yoga in Market Square on Sunday mornings. 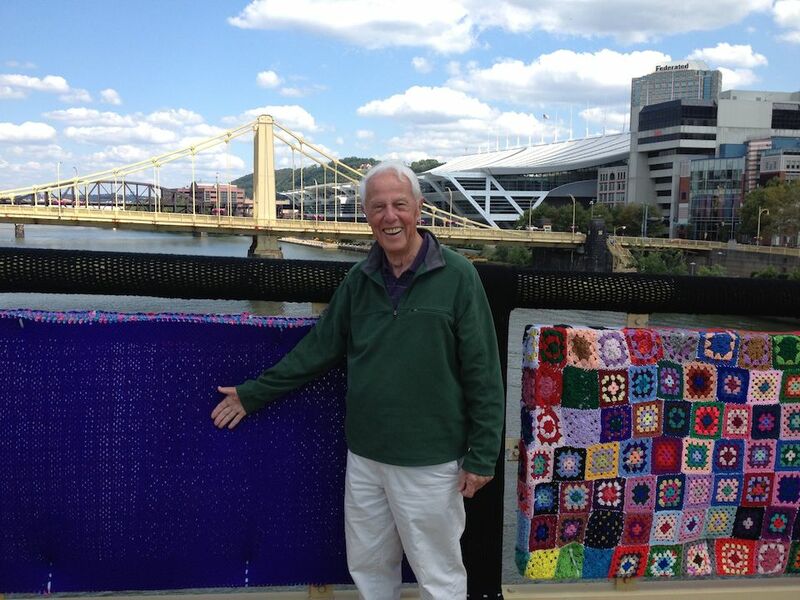 Richard Herbst from Bethlehem PA, was delighted to see the Knit the Bridge project while in town last summer. Urban environments are typically created by a cohort of urban planners, architects, governments and engaged citizens. Usually the process is long and drawn-out, involving significant political maneuvering, many levels of planning resources and large expenditures of capital. Tactical urbanism, instead, focuses on small-scale changes at the building, street or block level. Many of these projects are low-cost and short-term, but can become permanent parts of the landscape. According to Mike Lydon, principal at the Street Plans Collaborative and one of the leading advocates of the movement, New York City in particular has embraced tactical urbanism. One example is the city’s Department of Transportation (DOT) Plaza Program, which works with non-profits to create neighborhood plazas from underused streets, with the goal of creating new public space animated with social life and interaction. Been to Broadway recently? Paris, with its grand boulevards and fabulous public spaces, is normally not a city in need of urban interventions. But Paris can be desolate in July and August as many locals escape for their annual holiday. In 2002, Bertrand Delanoë, the newly elected mayor, created Paris-Plages or Paris Beaches, temporary beaches along the Seine, with chairs and umbrellas planted in the sand, the scene complete with food vendors and musical concerts. It’s been so popular with both residents and tourists that now there are three along the Seine. And in Hoboken, New Jersey, a pier has been transformed into a beach—no sand, but there are tall red lifeguard chairs, bean bag and low-slung hammock chairs and plenty of music, a few TV screens and food trucks known for exceptional fare. On summer weekends and evenings, it’s the place to hang. Bayardstown Social Club might sound uppity but it’s anything but. Meant “to serve city dwellers looking for a unique outdoor space,” the club is essentially for those who lack backyards and the option to barbecue or host cookouts. It’s BYOB and BYOM (meat). While it’s members only, a seasonal membership is only $20. Set in the Strip, in a former empty lot beside the German Motor Werks on Penn Avenue near 31st Street, the site is hosted by local design and engineering company Deeplocal. The activated lot now sports overhead lights, picnic tables and seating, horseshoe pit, grills and fire pits on the 5,000 square foot space. Not to mention rest rooms. New to the club, now in its second year, is a tarp for cover and a new stage and bar area Yes, they supply entertainment, too. The Garfield Night Market packs them in. Photo by John Norton. 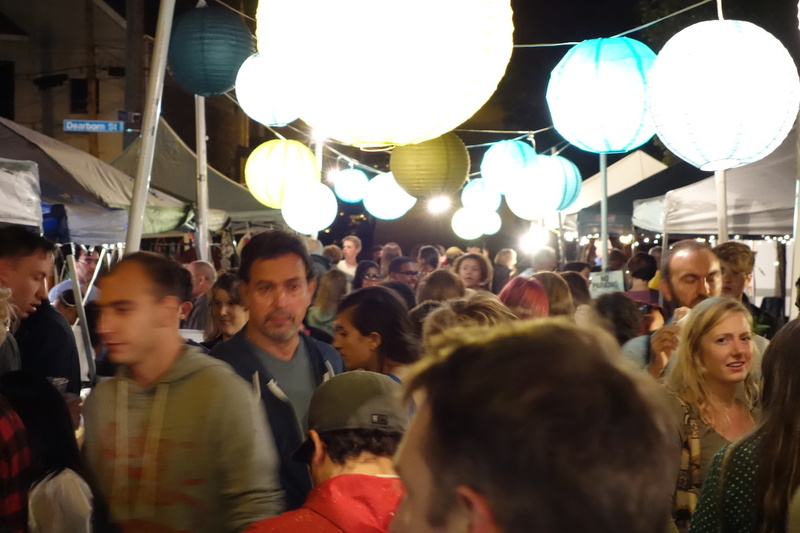 cityLAB, a nonprofit “that performs experiments with the city as our labo­ratory,” created the Garfield Night Market to attract people to the neighborhood and to support local artists. Under a panoply of bright and colorful lights, the market enlivens the neighborhood and makes for a fun spot to hang out. It takes place during Unblurred, the culture crawl in the Penn Avenue Arts District on the first Friday of each month. Nearby is another project of cityLAB –the construction of a “tiny house” on an empty lot. The tiny house movement is a social and architectural initiative that advocates living more simply—and inexpensively and quite sustainably—in homes under 1,000 square feet. “It’s about moving more of your life to the community and the outdoors rather than designing your home to meet every need you have: Using the local coffee shop, the gym, spending time in parks and other public spaces,” as Lee Pera, cofounder of D.C.’s Boneyard Studios, home of four tiny houses, is quoted as saying on the website. cityLAB, founded by urbanist Eve Picker, bought an empty lot on 223 N. Atlantic Ave. for a tiny house designed by Foundry Architects and Brian Levy. It even has an abbreviated—and clever—name: Minim. Part of a national movement, this house with its 10 x 20 foot dimensions will provide a local example of living simply with good design. Follow their progress online. Sunflowers take roots in vacant lots. Montage by Brian Cohen. GTECH Strategies is a Larimer-based nonprofit that works to improve the economic, social and environmental health of communities in Pittsburgh. 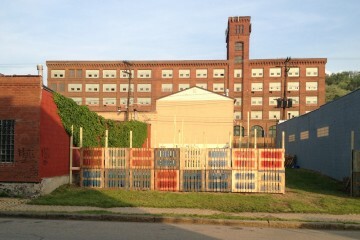 Their work includes transforming vacant lots and land owned publically, by the URA, or Housing Authority. Working in 33 communities and on 56 acres of land, the projects have included growing sunflowers on vacant lots—a model of tactical urbanism—along with the creation of community gardens and even making knotweed paper from the over abundant Japanese Knotweed plant. Now they’re taking it a step further, creating an online database to act as a resource showing real time community project data and vacant lots. Working with the PCRG, Pittsburgh Department of City Planning, Tree Pittsburgh, Grow Pittsburgh and Western Pennsylvania Conservancy, GTECH is creating an online interactive map to allow people to identify projects and a resource “how-to” guide. Their plan, says CEO Andrew Butcher, is to make this resource a national model for other communities. Art all Night, located in Lawrenceville, is a great spectacle of an annual event celebrating art and community in a big way. It started small in 1998 with 101 pieces of art and about 200 participants. Now it is run entirely by volunteers with a no fee/no jury/no censorship policy for artists. Art all Night now draws thousands to the neighborhood for an event that starts at 4 p.m. on Saturday with lots of kids’ activities and goes all night, ending Sunday afternoon. 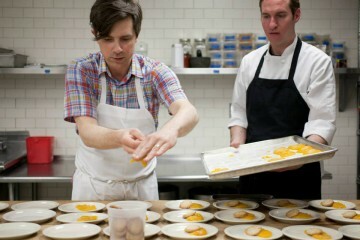 It’s an experience as well as a defining event for the community. PARK(ing) Day has been an annual event in Pittsburgh since 2008. The intent? To transform parking spots for one day into an entirely new use—say, a spot for al fresco dining or a place to view pop up art. The movement started in San Francisco in 2005, when Rebar, a San Francisco art and design studio, altered their first metered space into a public mini parklet. It has since become an open source project taking place around the world, with parking spaces being adapted to include temporary gardens, demonstrations, political seminars and art installations. Locally, organizers Chuck Alcorn, Thor Erickson, Sara Innamorato and Kevin Kunak are hard at work getting ready for the next PARK(ing) Day scheduled for September 19th. See the author, Diane Bossart, present at Pecha Kucha night on tactical urbanism in this video. Got a favorite project we didn’t mention? Feel free to add in the comments below.